It seems that in our part of the country—west central Iowa, that is—Cache Valley Virus (CVV) has been most prevalent just in the last couple of years. Until the lambing season of 2011, I’d personally never even heard of CVV. But that spring, many producers across the state seemed to have been hit with the disease to some degree. We were lucky; only one lamb born on our place had to be pulled with the assistance of a veterinarian and an epidural, producing a mummified lamb. Some other folks I know weren’t so lucky and lost a large percentage of their lamb crop to the debilitating disease. CVV is a mosquito-transmitted disease that can cause infertility, abortion, dystocia, stillbirth, premature birth, mummified fetuses, and various and severe deformities of the joints, spine and brain. According to the Jan. 26, 2011, article “Effects of Cache Valley Virus During Winter Lambing Season,” by South Dakota State University Extension, Russ Daly, extension veterinarian, says the most dramatic effects of CVV lead to birth defects in lambs mostly affecting the brain and central nervous system, but can also affect the skeletal tissue and muscles. Daly explains that these defects can show up as fused joints, curved or twisted spines, unusually thin and underdeveloped muscles, and enlarged skulls. 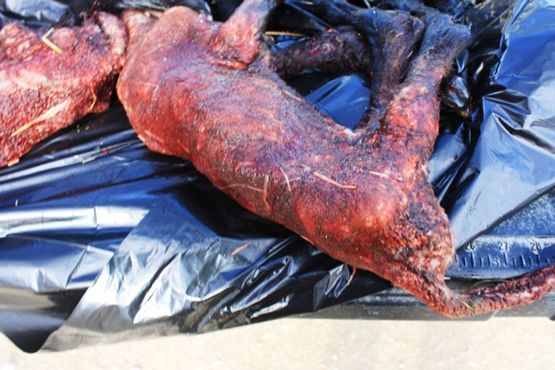 “Most lambs born with these severe defects are stillborn, yet CVV also can cause the birth of live lambs that act abnormal,” Jeff Held, South Dakota Cooperative Extension Sheep Specialist, says. “They can be drowsy, weak, or unsteady and typically all lambs within a set of twins or triplets are affected.” Lambs born alive are often too weak to survive and die soon after birth. 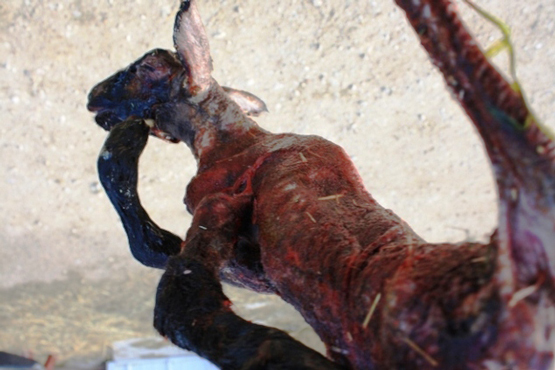 (all photos) If bred ewes are infected between days 28 and 45 of gestation, Cache Valley Virus can cause the stillbirth of lambs with severe deformities of the joints, spine and brain. Before calling the veterinarian in our single case of CVV, I was attempting to pull the lamb. After reaching into the ewe, I found what felt like the sternum. This led me to think the lamb was upside down, so I went searching for its head and front legs in order to turn it over to a normal birthing position, but I couldn’t find what I was looking for. After the veterinarian pulled the lamb, I could see why I was having so much trouble. Like Daly explains, the lamb had severe curvature of the spine – what I thought was the sternum was actually the chine. The lamb was sitting in the ewe in a normal birthing position, but its neck was bent between its front legs and its head was actually resting on its sternum. Further, the lamb’s legs were pulled up underneath it and its joints were fused, like Daly also explains, which is why I was unable to pull the front legs forward and proceed with a normal pull. Oftentimes, CVV causes abortions in bred ewes if they’re infected at less than 28 days of gestation; when infected during that four-week period, the embryos usually die and are reabsorbed by the ewe, unbeknownst to the shepherd. If a ewe is bitten by a mosquito carrying the virus after 45 days of pregnancy, there usually aren’t any adverse effects. 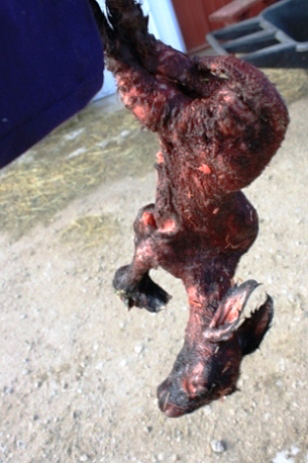 If infection – that is, the disease enters the bloodstream of the ewe and crosses the placenta and infects the lamb(s) – occurs between day 28 and day 45 of gestation, the fetuses usually develop arthrogryposis and hydranencephaly, more commonly known as “A-H Syndrome,” resulting in various congenital abnormalities affecting the central nervous system. Ewes carrying infected pregnancies usually don’t show signs of infection and at the time of abortion or birth, the virus is usually no longer viable. Further, once ewes have carried lambs infected with CVV, they generally develop immunity against the disease that can last for several years or their entire lifetime. Daly adds that the virus isn’t contagious. “We want to remind producers that the virus is not spread from ewe to ewe, even during the lambing season,” he says. First discovered in the U.S. in the Cache Valley of Utah in 1956, CVV is endemic in most parts of the U.S., Canada and Mexico, potentially affecting sheep over a wide geographic area that can include several states. For producers wondering if their sheep have the disease, diagnosis can be determined by a demonstration of antibodies in precolostral serum or body fluids. There aren’t any known vaccines for CVV and, Daly says, since it’s a virus, there aren’t any treatments available, either. But there are precautions that can be taken to reduce the chances of bred ewes contracting the disease and passing it on to their progeny. Producers can try breeding sheep outside of the rainy season and, therefore, out of mosquito season, though seasons are somewhat unpredictable and CVV can strike during the dry season, too. Ewes can be bred in areas with access to a building and fans, keeping biting pests away with some air movement; however, producers are warned to not let ewes congregate in a shed that has a build-up of manure. Breeding can be delayed until after a hard frost in the fall kills carrier insects. Sheep and facilities alike can also be regularly and lightly sprayed with Atroban or another insecticide. No matter what producers do, the take-home message for managing CVV is control of disease-carrying mosquitoes.